Nowhere are the big guns covered in more detail. Before Sgt. First Class Dean Michaelis (Ret.) wrote the book on sniping, he wrote a first-of-its-kind program of instruction for the Special Operations Target Interdiction Course. A member of the 1st Special Forces Group, he taught students everything they needed to know to succeed and survive. Now he brings that information to you, covering every aspect of the sniper's art: the history, equipment, skills and missions. He also includes reproducible forms, a military-issue .50-caliber cartridge tip color guide and his exclusive Program of Instruction for Special Operations Hard-Target Interdiction Course. An invaluable resource for military and civilian shooters alike. The Soviet AK47/AKM assault rifle is tough and dependable, and has spawned many spinoffs worldwide. These rifles are now available in the U.S., but solid information on them is scarce. Learn about specs, ammo and more - find out why the AK47 is the world's most widely used gun. This book offers up-to-date, practical information on how to operate and field-strip modern military, police and civilian combat weapons. Covers new developments and trends such as the use of fiber optics, liquid-recoil systems and lessening of barrel length are covered. Troubleshooting procedures, ballistic tables and a list of manufacturers and distributors are also included. This book shows you how to customize this reliable firearm into a super system suited to your needs. Whether you want to modify your AR-15 or just want an inside look at experimental weapons that may be on tomorrow's rifle range and battlefield, this is a book for you! A chilling study of small arms development and procurement in the post-Ordnance US small arms environment, wherein OSD �whiz kids� arrogantly called the tune and shooting watermelons at a picnic passed for engineering development. Beginning with the Black Rifle�s forebear, the Armalite AR-10, the story ascends through the experimental small caliber/high velocity (SCHV) program at Aberdeen Proving Ground and the .22 Gustafson carbine; the .22/NATO T48 of Project SALVO, and the competing Springfield and Winchester .224 rifles. An admirably researched in-depth examination of the many controversies surrounding the 5.56mm M16 �package� - where it came from: what it is; what it is not; and why. Now, Paladin's leading weapons author presents his exhaustive evaluation of the stopping power of modern rifle, pistol, shotgun and machine gun rounds based on actual case studies of shooting incidents. He looks at the hot new cartridges that promise to dominate well into the next century - .40 S&W, 10mm Auto, subsonic 9mms - as well as the trusted standbys. Find out how to make your own exotic tracers, flchette and sabot rounds, caseless ammo and fragmenting bullets. 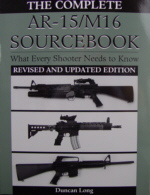 This carefully researched revised and updated edition of The Complete AR-15/M16 Sourcebook offers fresh insight into why the AR-15/M16 rifle remains a favorite of soldiers, law enforcement officials, civilian shooters and self-defense experts. In it, Duncan Long takes another look at the history of the "black-rifle" from the bureaucratic blunders and military infighting that ruined its reliability during the Vietnam War to the modifications that transformed it into the most reliable weapon in the world. He also examines the many military and custom spinoffs of the firearm, including an invaluable listing of its various models, supplemented by an impressive collection of photos and illustrations. In addition, he covers grenade launchers, SAW versions, and experimental weapons systems and even gives a detailed assessment of the OICW and other firearms now being tested as replacements for the U.S. military's M16 and M4 carbine. An entire section of the book is devoted to the very newest accessories for the AR-15, with a hard look at which ones will enhance its capabilities-and which could get the shooter killed. In addition to offering advice on improving an AR-15 rifle, picking the best ammunition for it, and ensuring its reliability, Long presents simple techniques for creating a one-of-a-kind exotic weapon built around this rifle through the selection of parts and accessories now on the market (and where to get them). Finally, the book provides complete instructions on how to field-strip, detail strip, troubleshoot, and assemble an AR-15. Whether you want a weapon you can rely on to get you out of a tight spot or wish to build a super accurate target version of the AR-15, this is the most complete and up-to-date resource available on what many consider to be the best rifle ever made. The AR-15 is one of the most popular rifles in the world, yet few shooters know just how accurate it can be with the right kind of tinkering. Now, two accuracy gunsmiths and experienced competitive shooters share their secrets for fine-tuning the AR-15 so it will maximize your ability to nail tight groups every time. This enjoyable book covers expert advice on barreling, floater tubes, sights and scopes, triggers, ammunition, support equipment and little-known gunsmithing tricks guaranteed to increase the accuracy of your rifle. This book debunks the myths, lays to rest the rumors and, through photos of a special cutaway Glock that clearly display its unique inner mechanisms, demystifies the design and operations of what is surely the most innovative handgun introduced in some time - and possibly in the history of handguns. "Hand cannons" are the biggest, loudest, most powerful handguns in the shooting world, firing cartridges from the famous .44 Magnum up to the mammoth .50 BMG. Duncan Long evaluates these massive pistols and reveals how to tame their recoil and muzzle blast and improve their accuracy. Almost any handyman with a drill can produce a gun in a few weeks, but the same is not true for ammo. Homemade Ammo provides all the technical know-how you need to manufacture your own rifle, pistol or SMG ammo from scratch. Includes chapters on primers, powders, brass, bullets, cleaning, caching and more. Whether a shooter or collector, inside the cover of this third book in the "Shooter's and Collector's Guide" series is a minutely detailed history of Eugene Stoner's AR15 and M16 rifles. The development of the M16 rifle is traced from the adoption of the first American-made flintlock musket in 1798 through Vietnam and the Gulf War to the present to show how the history of the country's military requirements molded the need for a small caliber, large magazine capacity, select fire rifle. The development of the M16/AR15 rifle as the current National Match Service Rifle for civilian and military target shooting is also described. It is safe to say that no other general issue military -derived rifle in the history of this, or any other nation, is as inherently accurate. If you are interested in the history of this fine battle rifle, or in tactical, bench rest, service rifle competition, or in just every day fun plinking, then this book will provide all the information you need to select, maintain, shoot and keep in good repair any AR15 rifle. The M16/AR15 Rifle provides a complete list of all models and variations being produced today complete with their features to aid in selection. It also provides a part-by-part break description for the M16 and AR15 rifles and their variations and the M4 series of carbines. Want to use your AR15 in competition? A detailed chapter describes the interaction needed between custom gunsmith and shooter to produce a tack-driving rifle, plus a survey of parts and accessories from barrels to sights. Three custom AR15s were built in the process of writing this book space gun, service match rifle and .22 rimfire version for short range and indoor practice. The step-by-step process is described. Also included are chapters on ammunition selection, shooting, maintenance and repairs, telescopic sights, .22 rimfire conversions, .308 AR15-type rifles and the future of the American military rifle as embodied in the OCIW concept. The M16/AR15 Rifle is as complete a book on the M16 and AR15 rifles as you could wish for. If you want your Mini-14 to fit your body, needs and pocketbook, here's the authoritative source on customizing this inexpensive, reliable rifle into an exotic super system. Find out how to boost your Mini-14's firepower (legally) so that it will not only generate a lot of double takes, but also deliver - at the range, in the field or in critical moments of self-defense. The Mini-14 is the most versatile modern rifle, used by homeowners, hunters, survivalists, law enforce-ment agencies and military forces. An infinite number of Mini-14s may be constructed with the many marketed accessories. Here is the Mini-14's history, model specifications and much more. Though the "bullet-proof" vest is a mythical beast, modern ballistic armor is stronger and lighter than ever before since the advent of the Kevlar fiber. This book details its myriad uses, from bullet-resistant suits, vests, goggles, gloves and other clothing, to armor for land vehicles and aircraft, shields for riot police and SWAT teams and even rings and bomb-suppression blankets as utilized by bomb squads. Includes lists of manufacturers, dealers and distributors. Noted weapons expert Duncan Long describes the .22 LR, single-shot, bolt-action, semiautomatic and large-caliber rifles that can be used for sniping purposes, including the U.S. M21, Ruger Mini-14, AUG and HK-94SG1. These and other models are evaluated on the basis of their features, accuracy, reliability and handiness in the field. The author also looks at the best scopes, ammunition and accessories. This is the most significant book on firearm silencers in years. Find out the story behind and incredible capabilities of modern silencers used by elite military units and secretive government agencies. Author Alan Paulson has been called "the dean of the American silencer experts today." This is the first and only look at home safes available to the average citizen, from pistol strongboxes to larger security cabinets and walk-in vaults! Learn the secret of finding the best safes at cheap prices, which safes are best for firearms, tricks for making burglars ignore your safe and much more! Streetsweepers is the newest, most comprehensive book out on combat shotguns, covering single- and double-barreled, slide-action, semiauto and rotary-cylinder shotguns, plus a chapter on grenade launchers you can mount on your weapon and info about shotgun models not yet on the market. Noted gun writer Duncan Long also advises on which ammo to use, accessories and combat shotgun tactics. Legendary reliability and classic design are the hallmarks of the Ruger 10/22 rifle and its forerunner, the .44 Magnum Carbine. In this in-depth look at both weapons, noted firearms author Duncan Long covers specs, troubleshooting, ammo and accessories - this book's got it all! Get your hands on a classic. Duncan Long provides clear, easy-to-follow instructions and illustrations for transforming a shotgun into a customized system that conforms to your body and pocketbook. Learn how to increase the shotgun's range and magazine capacity while reducing recoil with a few simple, inexpensive modifications. Best-selling author Gabe Suarez provides a graduate-level course in shooting with lightning speed and dead on target during the intensity of an actual gun battle. In Tactical Pistol Marksmanship, Suarez revisits some of the topics in the classic book The Tactical Pistol and presents even more gun-handling techniques, different twists on basic skills and unique tricks to help fine-tune how you aim and fire a gun under stress. Just some of the topics he covers are the primary requirements for the ideal service pistol according to combat vets; the rule of thumb for choosing a serious combat caliber; the 4 most important fundamentals of combat marksmanship; secrets to shooting in extremely low light situations when even tritium sights are of no use; the solutions to emergency failure-to-stop situations; and practical drills you can perform safely at home. In a highly publicized February 1997 shootout, two rifle-wielding thugs managed to outgun LAPD officers armed only with handguns after a botched North Hollywood bank robbery. It was not until responding SWAT officers armed with rifles arrived on the scene that the suspects were finally neutralized, but not without police casualties. Though not the first incidence of police officers being outmatched by criminals' superior firepower, this one was pivotal in bringing about a serious re-examination of the use of the rifle for urban law enforcement. In this book, Gabriel Suarez, founder and senior tactical instructor of his department's Tactical Rifle Team, exposes the myths that have long kept the rifle from being considered for use in urban policing. In addition, he details the many advantages the rifle affords the inner city police officer or SWAT operator in a wide range of deployment situations and presents innovative techniques that are replacing the "traditional" ones among agencies that have adopted the rifle. As we progress into the 21st century, the rifle is likely to become an increasingly integral part of the police officer's tool bag. This book will serve as a valuable guide to police tactical riflemen, making their jobs easier and safer as they make the criminal's job more difficult and hazardous.